Mexican gray wolf F883, Serenity, was born at the Endangered Wolf Center in Eureka, Missouri, in 2004. Serenity arrived at Southwest Wildlife in 2009, from the Arizona-Sonora Desert Museum in Tucson, Arizona, where she lived with two sisters. 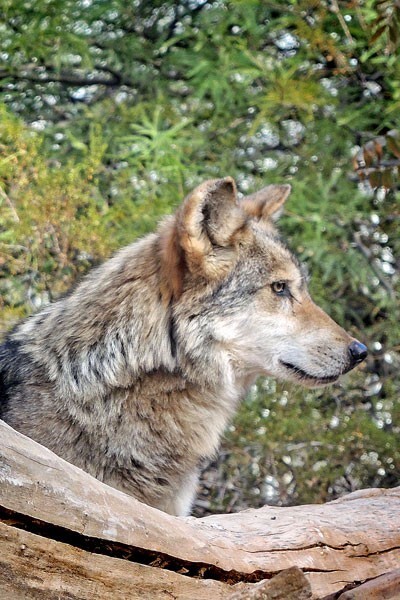 Previously a shy, quiet wolf, she is now in a large enclosure on Lobo Lane, where she sees people throughout the day. While she puts all that space to good use, these days, she seems to enjoy watching to see who might be passing by. Serenity has lived with her handsome mate, Brio (M942), since her arrival at our sanctuary. They are most often napping or strolling together. She is often the singer who begins the pack howl. Sponsoring Serenity is akin to keeping the howl of the wolf alive!